1. 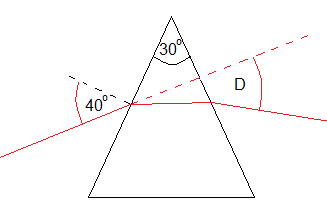 A ray of light is incident on a prism of refractive index 1.5 at the angle shown below	Calculate the angle of deviation, D of the emerging ray. Solution	2. To identical water waves with frequency of 0.1 Hz travel along the paths shown. One travels through a region of shallow water the other travels the whole way in deep water. If the waves start in phase what will their phase difference be when they meet?